How we begin laying out a new home depends on the project, site, and the features that are most important to the homeowner. For the “modern ranch” it was important to begin with the floor plan because the functional relationship between the public and private spaces of the home were of high importance to the homeowners. Before drawing any straight walls we typically begin with a space program (created through a collaborative programming process with the homeowner) and a simple bubble diagram. By depicted the spaces as fre-formed circles, we begin to study their relationships to each other and the surrounding site as well as how they will function on a day to day basis. The sketch above illustrates an initial program of spaces and how those spaces may be laid out in a floor plan view. By staying loose and using sketched circles we are able to have a conversation with the homeowner about the functions and relationships of spaces instead of the actual shapes and sizes. That comes later. After working out a general layout using the bubble diagram we begin to sketch straight walls to a relative scale. From there we can start imagining what the house may look like in 3-dimensions. 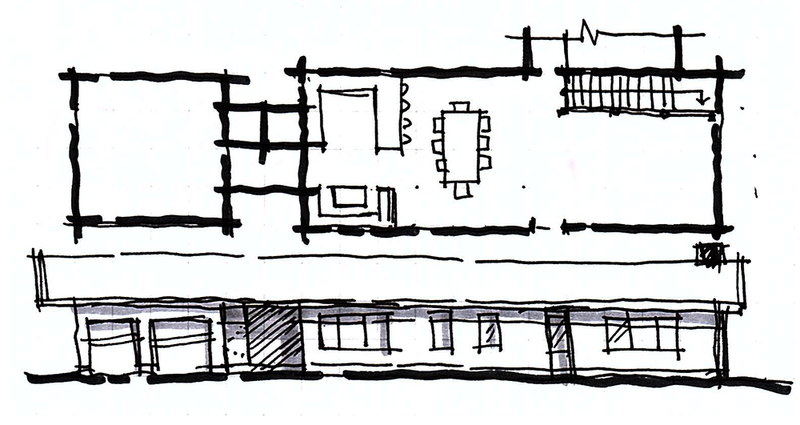 The sketch below is one of our first passes at a defined floor plan and elevation. Notice how the floor plan below relates to the bubble diagram above. In the final sketch of this series (below) we are still exploring different options for the front facade. Notice in the image above there is a large gabled roof on the right of the home. In the image below the gable has been removed creating a much more subtle elevation that sits low to the site and maximizes its engagement with the landscape. The effect on the floor plan is minimal.